Dissolved thorium (Th) isotopes and iron (Fe) are used to document the transfer of lithogenic material to the ocean. Two contrasting areas are compared: the Atlantic Ocean around Barbados Islands, under the influence of the Amazon plume and dust of Saharan origin, and the remote North East Pacific Ocean, far from dust inputs. Figure: The North Atlantic Ocean receives a much larger input of mineral dust blown from the continents than does the remote North Pacific. This contrast is seen clearly in the seawater concentrations of dissolved Thorium-232, the isotope of thorium that is enriched in the continental crust (left panel). The distribution of Fe, however, is much more homogeneous between these two ocean basins (right panel), despite that fact that continental dust is the major source of Fe in these areas. 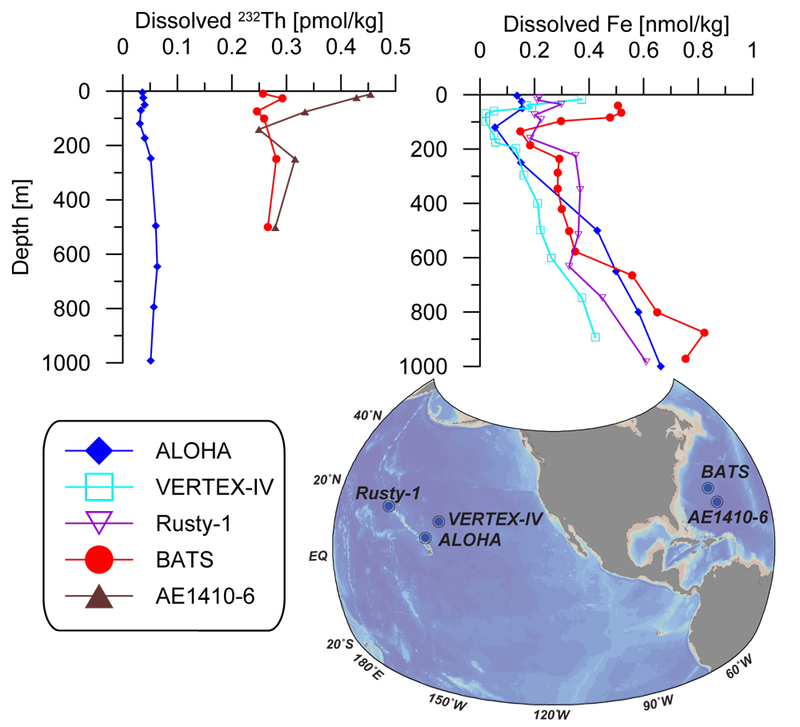 We think this is because Fe is highly buffered in the ocean by a combination of biological uptake, adsorption onto particles, and complexation by organic molecules, or ligands. See our paper for the colloidal nature of these dissolved metals and for evidence of a large input of metals from the Amazon River. Click here to view the figure larger.